Private vehicles remain the most common method of transportation in Tehachapi. However, the area provides two forms of public transportation, a taxi service, two rental car locations, and access to ridesharing services Uber and Lyft for those without a private ride. East Kern Express — Route 100, which travels from Bakersfield to Lancaster and back every day, makes a stop throughout the day in Tehachapi at Kmart on Mulberry Street and can make a requested stop on Cameron Canyon Road at Highway 58. The route, which makes stops in Keene, Mojave, and Rosamond, gives residents the option to travel throughout the county out of the Bakersfield and Mojave hubs. The intercommunity route is $3 for a general ticket, and $1.50 for a reduced fare for youth (5-15), seniors (62+) and disabled passengers with a “Reduced Fare Card.” For more information, call 800-323-2396 or 800-560-1733 or go online to kerntransit.org. 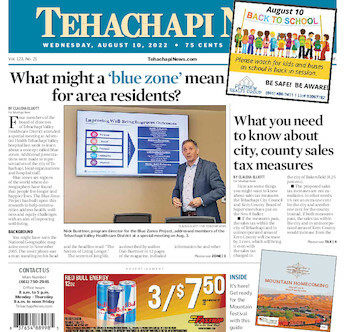 Tehachapi Dial-A-Ride — This localized public transit service is provided Monday through Friday from 5:45 a.m. to 7 p.m. and on Saturdays from 7:30 a.m. to 5:30 p.m. The fare is $2 for a general pass and $1 for a reduced fare pass; qualifications for this are the same as the East Kern Express. The service, which goes throughout Tehachapi, Old Town and Golden Hills, is suggested to be reserved at least a day in advance but same-day travels are available on a first-come, first-served basis. Passengers can also transfer to the East Kern Express in Old Town and Tehachapi. For more information, call 800-323-2396 or go online to kerntransit.org/dial-a-ride/dial-tehachapi. Uber: Download the Uber app on your smartphone to use. Lyft: Download the Lyft app on your smartphone to use.